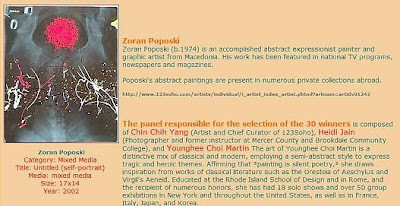 Zoran Poposki has been chosen among the 30 artists in "The Best of 123Soho 2007 Art Show" exhibit. His works have been selected from over 1,730 works of art by international artists. The panel responsible for the selection was composed of Chin Chin Yang (artist and chief curator of 123Soho), Heidi Jain (photographer), and Younghee Choi Martin (artist).